DEAR LYNNE: Your ho-hum attitude may cost you big ti.......wait a minute, I get it - boring! Well, if you don't want those little devils to bore into the lumber in your new home, then you need to apply some of the handy chemicals out there that contain boron. Not only can you protect your house's lumber from wood boring insects like termites, beetles and carpenter ants, the borate chemicals also protect against fungi (brown, white, and wet rot) that cause wood decay. 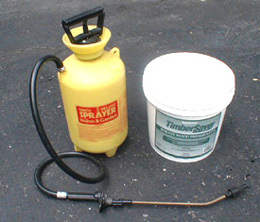 A simple hand-held sprayer and this tub of water soluble chemical is all you need to help make sure the wood in your home doesn't end up in the bellies of a bunch of termites. The application of borate solutions directly to lumber is not really new. These chemicals have been widely used in Europe, Australia, and New Zealand for nearly 40 years. The use of borate chemicals in the United States is beginning to grow for several reasons. The termite treatment industry in nearly a 2 billion dollar per year industry. This money is most often spent once the termites and other insects have already shown up for dinner at most homes. Applying borate solutions to lumber allows you to protect the wood before the unwanted guests arrive! The borate chemicals are unique. They are usually sold in powder form that readily dissolves in water. The borate chemical is derived from naturally occurring minerals that are easily mined. Once the solution is applied to bare lumber, it can soak deeply into the wood. The depth and extent of penetration depends on several things: temperature of the lumber, lumber species and texture, the internal moisture content of the lumber, and the number of applications. Dry, rough lumber absorb borate chemicals readily. There are numerous advantages to using borate chemicals on lumber. Although they are highly toxic to wood boring insects and fungi, they exhibit low toxicity to humans and other mammals. Once the wood has been treated and kept dry, the borate protection is extremely long lasting. What's more, the borates do not affect the appearance or workability of the lumber. The borates are non-corrosive to metal fasteners used in lumber, they are odorless, and they are extremely cost effective. The borate chemical treatment does have an Achilles' heel. As previously mentioned, you mix the powder with water in order to apply it to wood. This same water in the form of a plumbing, roof, or siding leak can, over time, re-dissolve and remove the borates from the lumber. If this occurs, the wood is susceptible to attack. This is one reason that borate chemically treated lumber isn't readily used as an exterior wood preservative against insect and rot attack. Rain water and contact with moist soil will simply render the chemicals ineffective over time. To protect exterior lumber that has been treated with borates, you need to apply a penetrating water repellent on a regular basis. Since most lumber used in homes stays dry for the life of the home, water leaching shouldn't concern you too much. You can apply borate chemicals to the wood in your new home yourself. It is best to apply it to lumber when the house is under roof and the framing lumber will receive minimal or no direct rainfall. You want to spray or brush on the borate solution before the lumber is covered over with insulation, drywall, or plastic. Consult with your builder as to how you can be worked into the construction schedule. With a couple of helpers and some hand pump sprayers, you can complete this job in no time. If possible, consider two applications on separate days. Borate solutions can be applied to existing homes. The problem, however, is that many wood surfaces have been covered by other building materials. Wood boring insects may be able to still inflict damage by finding their way into untreated wood. When you go to buy borate chemicals, look for ones that are labeled and registered as wood preservatives. These are the ones that are classified by the Environmental Protection Agency as safe for use by the general public. Some borate chemicals are registered as insecticides and can only be applied by licensed and trained technicians. Author's Note: We've received other emails with similar problems or questions. Here's one from Aaron S. of Los Angeles, CA, regarding termite fumigation. "My house was fumigated for termites covered with a tent etc. After removing the tent two days later, we entered our house but there was no odor of gas at all. A while later, we saw insects, spiders, roaches etc. moving around. The fumigation company claims that they mix a substance with the gas so that it will not have an odor. My question: Shouldn't there be a gas odor and dead insects? We can't see the termites inside the wall, but we feel that if all the insects are still alive, probably the termites are not dead either. Please, let us hear you opinion. Thank you very much!" Doing a little online checking, the chemical used during termite fumigation is targeting only termites. It will not kill spiders, ants, bed bugs or cockroaches. So Aaron, you may still see other insects moving around. There is a product out there that a lot of companies have called Timbor or Tymbor, not sure. Anyway, it it highly effective against termites and it you have your framing sprayed so that it all can be accessed, it carries a warrantee against termite infestation from the manufacturer. Ten or more years, not sure but I know of none better. Products with boric acid are good but they are heat sensitive and will loose their effectiveness dues to the heat over time. I'm building a house on a trailer that is currently raised off the ground a few feet and we found termites in the ground. Our plan is to treat the underside of the floor system with a borate treatment before we put in the insulation and a moisture shield just to be sure that we don't lose all of our hard work to those nasty buggers, but we have chickens. Turns out chickens think termites are delicious, which is awesome, but I'm worried about the possibility of them eating a termite after it has eaten borate and getting sick, or worse. Does anyone know if these treatments can be dangerous to chickens if ingested? Thanks! I believe termites and carpenter ants only attack wet wood, particularly when it is beginning to rot, so that kind of defeats the protection that borates might provide since water will wash the borates out of the wood. Wayne, while moist lumber is easier to munch on, I've seen, and repaired, lots of termite and carpenter-ant damage that was in dry wood. How did you come to formulate your hypothesis? Is boric acid sprayed wood, once dry, safe for people exposed in interiors, as opposed to covered by drywall, for example exposed beams, flooring, etc...or should it all be covered up with varnish or some other wood finish?